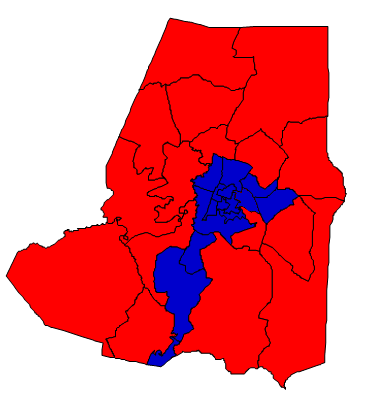 Wayne County is located in eastern North Carolina and had a population of 122,623 as of the 2010 United States Census. The county seat is Goldsboro. Wayne County is also the location of Seymour Johnson Air Force Base. Wayne County was formed in 1779 from the western part of now-defunct Dobbs County. It was named for the Revolutionary War general “Mad Anthony” Wayne. Politically, Wayne is divided between the city of Goldsboro, which is predominantly black and Democratic, and its rural areas, which are white and extremely Republican. Like many eastern counties, Wayne is polarized by race, with Mitt Romney winning over 85% of the county’s white voters in 2012. Forecast: Back in 1976, Wayne County was one of two eastern North Carolina counties to reject Southerner Jimmy Carter for Gerald Ford (the other was Lenoir). Even back then, Republicans were doing very well with whites in Wayne County. This dismal performance with white voters is the biggest reason why Wayne County has not voted for a Democratic presidential nominee since 1964. But while Republicans are still very strong in Wayne County, their performance here relative to the national average has been dwindling since 1996. President Obama even managed to perform better here than he did in 2008. There is an indisputable Democratic trend in Wayne County. Why? The white composition of the electorate has been steadily declining, and this was accelerated by the Obama registration effort during his two presidential campaigns. Whites now constitute less than 60% of registered voters. Given the Republican dominance with white voters in Wayne County, that’s still enough to win – for now. And the high black turnout seen in 2008 and 2012 may not resurface in 2016, when the Democratic nominee will probably not be African American. However, what should worry Republicans the most here is the growing Hispanic population. Hispanics now constitute over 10% of the population in Wayne County, but less than 2% of registered voters. If these Hispanics register and should their voting habits prove to resemble Hispanics nationwide, then Wayne County becomes a toss-up. Still, Wayne is an extremely inelastic county, and the white composition of the electorate is probably enough for Republicans to win here for at least a few more years. But if Republicans failure to address the demographic problem, then Wayne and many other eastern North Carolina counties will go blue – despite their overwhelming dominance with white voters.